The book shows the way that Greatness exists in all of us. It’s simply a matter of pulling that greatness out. The book helps to build self-confidence and strength to achieve your goals. 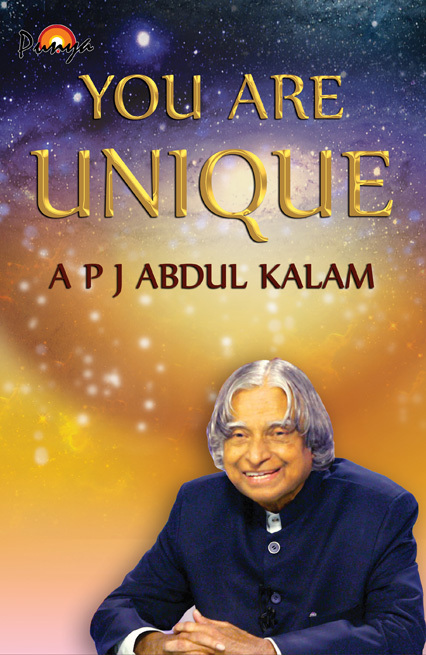 The thoughts of A P J Abdul Kalam, in You Are Unique, with their heartfelt sincerity, chiselled logic and experienced intuition are amazing lamps on the path of life, giving strength to seek one’s Unique Self. A message of spirituality, honesty, being unselfish and the value of giving emerges from these pages as from his life. The world has changed and there is a need for awakening together the head and the heart. While poems touch the heart and leave a deep impression, his prose leads you to think how to go beyond the rock walls of conditioning, perceptions and prejudices to achieve success and fulfillment. Clearly presented thoughts, in You Are Unique, become our inspiration and constant companion, flashing ‘upon the inward eye’ at our decision making, vision creating as well as ordinary moments of life. The style is such as if you are talking to Dr Kalam, asking and getting answers for your questions, with graphic depiction of thoughts and concepts. Visually appealing, illuminating, dotted with his simple and charming experiences of life, you will love to read this book again and again. Eleventh president of India, Dr A P J Abdul Kalam is one of the most distinguished and world acclaimed scientists. He has received several awards, including the highest civilian award of India— Bharat Ratna. He rose from being a technocrat to the 11th President of India, the largest democracy in the world. His penetrating vision and deep concern for removing human misery places him in the class of prophet poets and writers who inspire and elevate fellow human beings and show the path for being noble, honest and true to oneself, to discover one’s unique self. His mission of life is inspiring children and youth to remove misery from the face of earth. He has several best sellers to his credit, including The Luminous Sparks and Wings of Fire.